When bed bugs want to find their next meal, they’ll follow the trail of body odor, heat, and carbon dioxide that we emit in our sleep. Bed bugs won’t come out of hiding if these signals are not present; instead, they’ll go into a hibernative state, and can live for up to a year without a blood meal. In the past, passive bed bug monitors and traps (like ClimbUp Insect Interceptors and SenSci Volcano) required a host sleeping in the room to provide those necessary signals. Thanks to the new SenSci Activ Bed Bug Lure, that’s about to change. Now, you can significantly increase your devices effectiveness at attracting and capturing bed bugs by converting your passive monitors and traps into active ones. 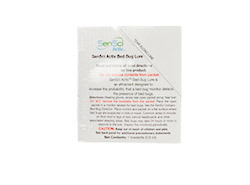 SenSci Activ is a bed bug lure designed for use in combination with your passive bed bug monitor or trapping device. Activ’s goal is to attract bed bugs by slowly releasing an odor that simulates the chemicals found on the surface of our skin, one of the senses bed bugs use when looking for a potential host. The odor is introduced through a small tear on the packet, providing a controlled release that attracts bed bugs for up to 2-3 months. Do not remove the towelette from its packaging or expose more than the instructions permit, as overexposure will lead to a shortened effective window. Before handling an opened SenSci Activ Lure, you should be wearing a pair of nitrile gloves to avoid skin contact with the chemicals found inside. To ensure safe and effective usage, be sure to read and follow the products label and MSDS before opening the lure. You can install SenSci Activ by tearing off the designated corner of the packet, exposing a portion of the towelette that’s located inside. Once you have an open lure in your hand, place it inside your monitor (or intercepting) device and strategically put them on paths you believe bed bugs are using to reach you. SenSci Volcano is a durable and reusable bed bug trap that was designed for use with SenSci Activ. The monitor features an easy to climb exterior and a detachable window for easy inspection and lure installation. To use SenSci Activ with SenSci Volcano, simply open a SenSci Activ Lure by following the directions found on the label and place the opened packet on the center of Volcano’s inspection window. With the Activ lure in place, carefully attach Volcano’s window back in place and make sure that the active packet is not pinched between the monitor’s inspection window and the top. SenSci Activ is an effective bed bug lure that can even be used in combination with our 4-step bed bug protocol. If you want to convert your passive bed bug monitor into an active one, SenSci has you covered with their versatile and easy to use bed bug lure. SenSci Activ is also compatible with most passive bed bug monitors and traps, allowing you to increase the effectiveness of almost any passive bed bug device. mimics chemicals found on the surface of the skin.